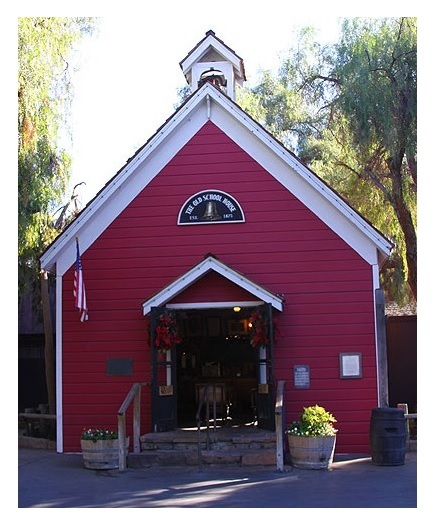 This past weekend me and my family went to Knott’s Berry Farm and one of the things I have always done is make a trek to the Little Red School House to gloat over how I have family that went there on my grandfather’s side under the Tice name when the school house was in Iowa or Kansas. I know in its history it moved a couple of times before its last time to Knott’s Berry Farm at the behest of Walter Knott himself. The last time I was there, years ago, there were names on each of the small chalk tablets at the desks but this time they were all blank. I asked the person who was playing the role of the teacher if the list still existed and she said No. She looked almost exactly like an older Nina Duden, first school teacher, a bit scary. Would have been nice if they still had the roster of children that went to it or at least their names still on the little chalk slabs at each desk. I only recall generally where the seat was that bore the name Tice on the chalk slab, it was disappointing to see that little bit had changed. I feel to my family its lost its uniqueness. I think when most visit the school house they really don’t realize its true history and think of it more as a prop in the Ghost Town area that it is at now. I’m sure I will continue to visit it whenever I vist the theme park.